Gaijin Kanpai Ep.149 - "Too Soon-ami"
But you don't care about that. You care about Japanese Music! I hope you don't mind, but we bought you a cake. 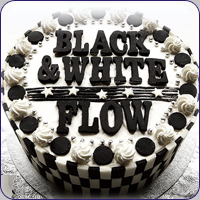 OK, so it's just the album cover for FLOW's Black&White album, but i guarantee a picture of a cake tastes just as good as one I'd actually bake. Jaylee is apparantly a fantastic baker, so make him concoct confectionaries for you. I'm not your slave. Neither is Jaylee. Bake your own sh!t! I always seem to start nice in these intros and quickly blame you guys for something. I apologize. We're still friends, right? How about a little T-ARA review as a peace offering? GK-AA Picks? A new pony? Trust me, you don't want the pony. Those things poop like crazy! NOOOOTES! - Switching days, hosts, and more! - Tohoshinki Translation now live! - U-KISS Translation now live! - LoKi has a heart-on for the new Rurouni Kenshin trailer. - Universal doesn't want Perfume to collaborate with Jason Derulo!